I've seriously been excited about November for a while now. I've been stockpiling all these goodies in anticipate of my many "surprises" that I have planned for you wonderful people. Now that phase one is complete, I'm moving on to phase two. Phase two involves getting the word out about my November sponsor specials. If you purchase an ad with me for the month of November, it will run for 60 DAYS. 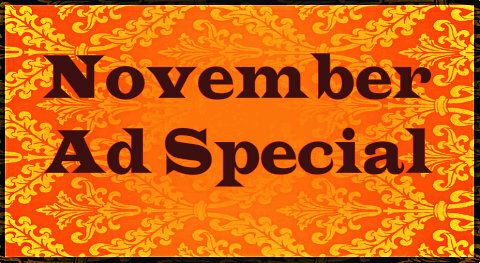 Which technically means it's a November/ December ad special, but it just sounded better as November Ad Special. Straight, simple and to the point. No unnecessary wordage. Anyhow, all ads will go live November 1st, and will run until the end of December. Depending upon how many sponsors I have, I may break your Sponsorship Spotlights down into two or three sections to make sure that you guys all get equal exposure. Basically, I'm just going to ask you guys all what is it that "YOU" want to do (within reason), and then I'll just go along with it. To find out more information about the services I offer, be sure to check out my sponsor page. I'm looking forward to working with you guys! new[est] follower from the blog hop! your blog is adorable! can't wait to keep following along!